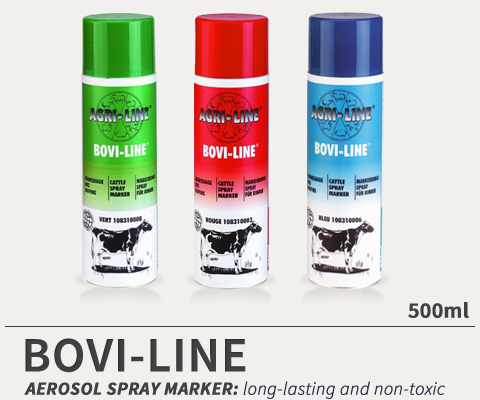 The use of BOVI-LINE, an intensive and quick-drying colour, is a simple and secure method for uniquely identifying livestock, on which not only farmers, but also vets, insemination technicians, feed consultants or monitors are dependent. Aerosol markers are an economical and convenient way to mark cattle. The bright, long-lasting marks are non-toxic and easily seen on all colors of cows. BOVI-LINE is available in the colours red, green and blue.